Last updated by Shari Harley at June 17, 2018 . The first time my now almost-three-year-old son stood up in his crib, I didn’t see it. I was sitting in his room watching him at the time. I was literally watching him in his crib, and yet I didn’t notice when he stood up for the first time. I wasn’t looking at my phone or talking with someone else. It was just he and I in the room, and yet I was so distracted with whatever I was thinking about, I didn’t ‘see’ him stand up for the first time. When he was born, I was given the advice to stay present. And I scoffed at that advice. Of course I would stay present. Living in the present sounds so simple. When you walk, walk. When you eat, eat. When you work, work. We’ve all heard this advice, and yet, it’s so hard to do. Before having a baby, I would lie awake in bed at night worrying about the vendor who wasn’t the right fit, a decision I needed to make, or something I needed to finish. Now I think about those things when I’m ‘with’ my son – watching him, but not seeing. If we’re thinking about anything other than then what we’re doing, we’re not living in the present moment. Instead, we’re focused on either the past or the future. And this is where stress and anxiety live. If we only think about what’s happening now, it’s impossible to be stressed, anxious, or worried. The question is how to stay present when our brains want to do anything but. Live in the present strategy one: Write down everything you need to do, so you can free your brain from thinking about it. Live in the present strategy two: Don’t over commit or over plan. Plan days with a schedule that you can easily achieve. Over committing causes stress and worry. Live in the present strategy three: Only commit to do things you really plan (and at least in your personal life, really want) to do. Live in the present strategy four: Give yourself a limited and prescribed time to talk about a problem and/or to worry about it. When the time is up, let it go and think about something else. Ask the people around you to help hold to this time limit. If you bring the topic up in conversation, ask your colleagues to point out that you’re still focused on the problem and refuse to have the conversation with you. 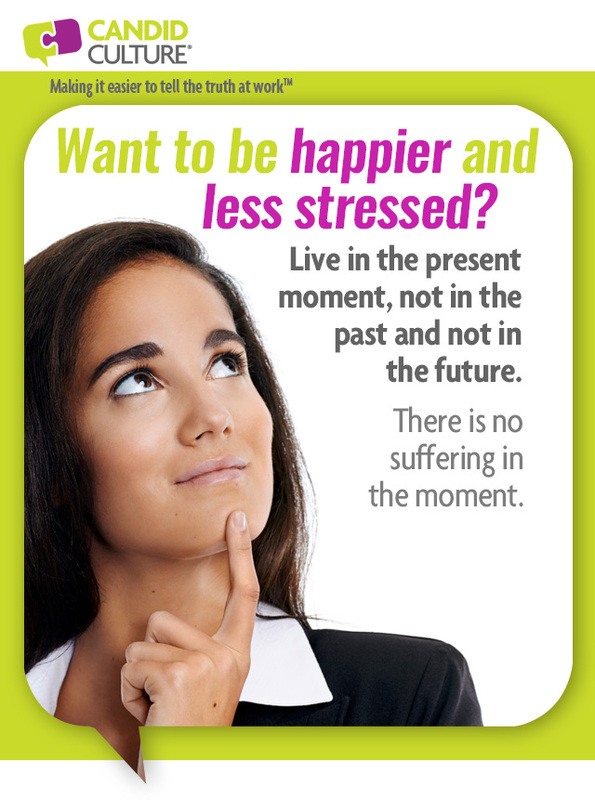 Live in the present strategy five: Remind yourself (from moment to moment) to be present. When I’m with my son, I remind myself to really be with him and not thinking about or doing something else. Live in the present strategy six: Compartmentalize your time. Determine how long you’re going to do something, and only do that activity during that time period. When the time is up, move on to something else. When I’m not with clients, I spend half of each workday with my son. And when I’m with him, I don’t have my phone so I’m not tempted to check my email. When I’m with him, I’m really with him. Live in the present strategy seven: Leave your phone some place you can’t see it. We are addicted to these little people separators. I find that one of the only ways I don’t check my phone, is not to carry the phone with me. Being in the present moment requires discipline. If you want to feel more peaceful and less stressed, think only about what you’re doing. Let everyone else worry about the rest. The first time my now eleven-month old son stood up in his crib, I didn’t see it. I was sitting in his room watching him at the time. I was literally watching him in his crib, and yet I didn’t notice when he stood up for the first time. I wasn’t looking at my phone or talking with someone else. It was just he and I in the room, and yet I was so distracted with whatever I was thinking about, I didn’t ‘see’ him stand up for the first time.